Check out what some of our members have to say about their experience with the services and community at CrossFit Obsession. 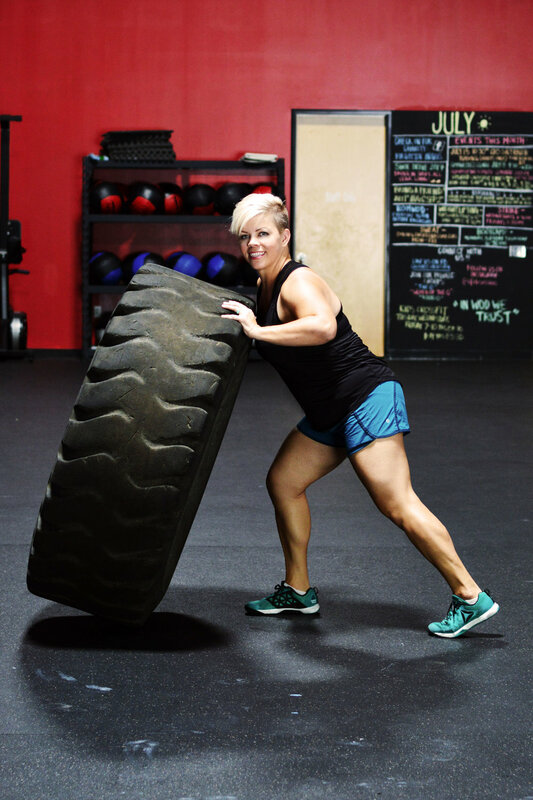 I CrossFit to be healthy, to set an example for my kids, and to do something for me. Before I started with CrossFit Obsession, it scared me! I thought it was for people who lived in the gym, not "average" people like me. Nearly two years in, I keep at it because it is fun! I love that it's different everyday. It is so much more than just going to the gym. CFO is a family. It is truly a no-excuses environment: There are a variety of classes and times, free childcare is provided, and the coaches will help you regardless of your ability level. Not only is CFO a community within the gym, I love that they strive to make an impact in the surrounding community through fundraisers and charities of the month. I was on a 10 year sabbatical from all things exercise when I was introduced to CrossFit. I didn’t care about fitness and certainly didn’t care about what fuel I put into my body. After I started working out here on a dare from Coach Dan, I found something I was missing for 10 years. The real me. He made me care about me. Not just the exercise part, but my body as a whole and everything I put into it. This box (what we call our gym) is made up of amazing athletes, coaches, kids and teens, husbands and wives, friends, and most importantly family. The focus on form and function has kept me injury free and at 35 years old, I am now in the best shape of my whole life because of this place. Now, I can’t even imagine my life without all these wonderful people and without this amazing place in it. Walking through these intimidating doors was the best decision I have ever made. Crossfit changed my life! No, really! The first time I remember thinking I was fat, I was seven years old and I have thought that ever since. I have never been super obese, but always carried around extra weight. I dabbled around in sports a little in junior high but for the most part was a choir kid, so I have never been super athletic either. I would never in a million years consider myself CrossFit material. Fast forward: I find myself 29 years old, I’m done having children, super overweight and feeling more horrible than ever. My friends and neighbors, the Kretschmans, had discovered something and they couldn’t stop talking about it! “Come try CrossFit!” they would tell me weekly. “Yah right! I’m not crazy!” was my consistent reply. That was for ex-military and cops and firefighters right? Not exactly my crowd for physical activity! Well, eventually by some act of God, they got me in there. I was so scared I thought I would puke and it was humiliating, but not because other people made me feel that way. Everyone was GREAT and completely supportive and by yet another act of God, I went back. I was feeling like if I could keep up with this, I could really lose some weight. I was feeling accomplished and starting to get a sense of this amazing community aspect that goes along with CrossFit. No matter how stupid I felt, everyone around me was cheering for me to finish. I got hooked pretty quickly after that. The results have been awesome! I am strong! I have completely changed my views on my body. I don’t want to be thin anymore; I want to be strong! For the first time in my entire life, I don’t feel so fat! For the first time, I don’t WANT to be thin! This has been huge for me. My self-confidence has undergone some major improvement and so have my athletic abilities. I have something to look forward to every day that is positive and good for me! We all celebrate each other and our accomplishments and we are all in it together. I feel like Obsession is a very unique and special group of people. We have all come together to build the foundation for what will be an amazing community and we all are so vested into this group along with Dan and Danielle. We all truly care about each person and the future of this box. Each person brings something special and valuable, no matter how many people are in that workout. Dan stands out as an amazing coach that focuses on form and ability so that people don’t get injuries and make improvements fast and correctly. This is a place that, like myself, will change many others’ lives. How exciting to watch people better themselves and their health! I have always hated working out in a gym, and I was skeptical and resistant to the very idea of CrossFit. But working a computer job for 20+ years had caught up to me in the form of chronic back pain that was impacting my daily quality of life. I needed to act. The first couple weeks were... interesting. I learned the very, very basics of some of the technical lifts while I built my strength and endurance. My progress, from near zero to something, was fairly quick. For example, my first week after the initial class, I was only able to deadlift 35 pounds when that weight started 4 inches off the ground! It wasn’t long before I’d progressed to deadlifts well beyond my body weight. I knew next to nothing about what I was in for, except that it was obviously for people more fit than me. With my non-athletic background, going in the first time was daunting! I was anxious I'd be the weakest, slowest, least masculine guy there. In hindsight, that was very silly. I did start as the weakest, slowest, least skilled guy; however, it didn't take long for me to build skill, endurance, and strength. Staying focused on exercise has always been a challenge for me - an insurmountable one. But the variety of workouts and challenges keeps it fresh and interesting. The variety and my success have held my interest, as has the community. I have met so many good people in my classes, and I love seeing others progress. It keeps me coming back 4-5 times a week, every week! CrossFit Obsession has improved the quality of my life - dramatically. The health benefits of CrossFit have been HUGE for me. I’m no longer pre-diabetic; all of my blood work is in the perfect range. My body image and self esteem have been improved so very much. As a mother to young daughters, I feel it is important to model a positive body image and for my daughters to know that strong women are beautiful women. I have gained so much E-N-E-R-G-Y and improved my mindset. I am capable of doing hard things because I walk into the gym and do hard workouts every day. The biggest benefit is the energy I’ve gained because I’m taking care of my body which affects every aspect of my life: family, work, hobbies. CFO has great coaches who care about form and become your friends and mentors. Also, the community is amazing, everyone is uplifting and inspiring. We all genuinely care about each other in and out of the gym. Before I started CrossFit, I thought it was only for the super fit. I started at the box on my 41st birthday. I was very intimidated by CrossFit before coming to CrossFit Obsession. I was worried that I would embarrass myself and I was worried about getting injured. After all, I'm not getting any younger. Now, I'm hooked. I feel healthy, strong, and confident. In the beginning, it was the encouragement I received at CFO that kept me coming back. Now I'm motivated by the results I see in myself and it keeps me coming back for more. The community at CrossFit Obsession is amazing. The people here have been my biggest supporters. The coaches are also fantastic. They are very conscious of everyone's abilities and consider safety to be a priority. They ensure proper form is used to prevent injury. They go out of their way to make everyone feel welcome and to become the best they can be.